Too much soul searching lately and not enough food methinks. Not that we’ve been cooking anything remarkable because, you know, buuusy. Unlike my recent post about it, I think this time we have been legitimately busy. Work has been hectic, Sam’s been a bit sick, the Christmas gatherings have started and we’ve had a 3rd birthday party for 50 people to plan. How did we even get to 50 people? One of the small challenges and great joys of living in a country town is the friendship network which extends from one connection to another, to another. So we made a cake, fired up the barbecue, filled the kids with too much sugar and food colouring and then everyone went home in a storm of over-tiredness. Fun times. We didn’t have a party for the twins last year so it was a nice way to say thanks to everyone who’s invited us to celebrate with their kids over the last two years. Anyway, this post is meant to be about food. So here’s a similar recipe to one I published in Downtown magazine’s 2016 winter issue. In the magazine I used a slow cooker, but here is the stovetop method - or you could even do it on a side burner on the bbq. Much more appropriate for the current season. Another seasonal adjustment is the removal of fennel. You could add a bulb of sliced fennel if you love the flavour, but sometimes it's a little tricky to find in summer - fennel's in season through Autumn and Winter. Two years ago I did a cooking class st Sydney Seafood School. We covered the basics, which for most of us are far from basic. Filleting a fish, segmenting a crab, preparing octopus and cooking mussels. Mussels have always been a mystery to me. These tight glossy black shells that miraculously open just at the right time. And what about the ones that don’t open and how sick will they make my guests? Like most things I write about here, turns out it’s not hard. For Tamworth readers, you can buy fresh mussels from Woolworth. They come live in a sealed packet which is actually how you’d buy them from the fish markets, too. When you buy the mussels they must be closed. Sometimes they might be partically open, this is because of the lights in store and is ok, but if they're quite open even in a dark environment then no, not ok.
Scrub mussel shells together under cold running water to remove any barnacles. You'll find most mussels are pretty well de-bearded if you buy in the packet as described above, but if not, remove beards by tugging towards the round end. Never use the liquid that comes out of the packet as it is far too salty. Heat the olive oil in a large deep frying pan, or wok, over a medium heat. Add the onion, garlic, pepper and a little salt (mussels are really salty, so don't go overboard), cover and cook over a low heat for about 10 minutes, until onion is soft. Stir in the tomatoes, return to the boil, add mussels, cover and cook over very high heat for a couple of minutes, shaking the pan occasionally until shells start to open. As each shell opens use tongs to move it to a serving bowl. Any that don't open when cooked can be pryed open with a blunt knife over the sink. See my note above about eating mussels that don't open. Reduce heat to medium and cook sauce for a few minutes until it reduces and thickens slightly. 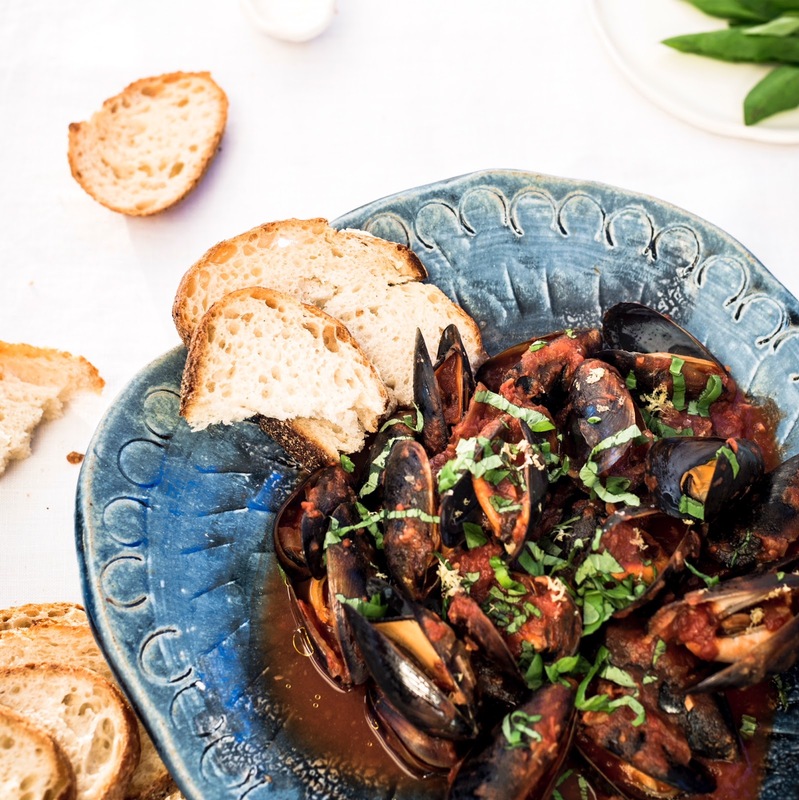 Stir basil through sauce and pour over the mussels. Serve with crusty, fresh sourdough. Serves 6 as an entree, or 4 as a main meal with a green salad.